Gamasutra is running and interesting story about the biggest browser-based game sites where we can learn some pretty amazing numbers measured by ComScore such as "Total player time with browser-based online games increased 42 percent in 2008" ... interesting! After shutting down six of its projects and letting go some of its employees, Google is now Turning the page on Print Ads. "In the last few months, we've been taking a long, hard look at all the things we are doing to ensure we are investing our resources in the projects that will have the biggest impact for our users and partners. While we hoped that Print Ads would create a new revenue stream for newspapers and produce more relevant advertising for consumers, the product has not created the impact that we — or our partners — wanted" . That's what I thought when I saw Anthony Calzadilla's article "Building an Animated Cartoon Robot with jQuery" article through WebAppers. Just check the demo to see how nice this is! "This project was created by layering several empty divs over each other with transparent PNGs as background images. The backgrounds were animated at different speeds using a jQuery plug-in by Alexander Farkas. This effect simulates a faux 3-D animated background dubbed the “parallax effect” originating from old-school side scrolling video games. 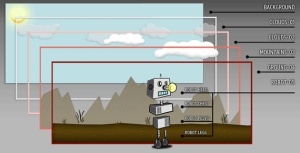 The robot is comprised similarly to the background animation scene by layering several DIVs together to create the different robot pieces. The final step, was animating the robot with some jQuery." A little more than a year after its first release, Microsoft today announces the immediate availability of the second version of its Silverlight plugin. Silverlight 2 is a programmable web browser and mobile phone plugin whose main goal is to compete with Adobe's Flash in vector graphics, animation, online video streaming... and many other "rich" user-experience tasks. And it seems to be working as Silverlight is now available for a quarter of the consumers worldwide, according to Yahoo's article. If you haven't read it yet, here is the very funny history of browser user-agent string as narrated by Aaron Andersen of WebAIM. "In the beginning there was NCSA Mosaic, and Mosaic called itself NCSA_Mosaic/2.0 (Windows 3.1), and Mosaic displayed pictures along with text, and there was much rejoicing. And behold, then came a new web browser known as "Mozilla", being short for "Mosaic Killer", but Mosaic was not amused, so the public name was changed to Netscape, and Netscape called itself Mozilla/1.0 (Win3.1), and there was more rejoicing. And Netscape supported frames, and frames became popular among the people, but Mosaic did not support frames, and so came "user agent sniffing" and to "Mozilla" webmasters sent frames, but to other browsers they sent not frames." Google Chrome browser: a step further to the Google Operating System ? Sensational story or threatening Vista security hole ? In what seems to be a sensational / tabloid article inspirationally named Vista's Security Rendered Completely Useless by New Exploit, Neowin reports that "this week at the Black Hat Security Conference two security researchers will discuss their findings which could completely bring Windows Vista to its knees. Mark Dowd of IBM Internet Security Systems (ISS) and Alexander Sotirov, of VMware Inc. have discovered a technique that can be used to bypass all memory protection safeguards that Microsoft built into Windows Vista. These new methods have been used to get around Vista's Address Space Layout Randomization (ASLR), Data Execution Prevention (DEP) and other protections by loading malicious content through an active web browser. The researchers were able to load whatever content they wanted into any location they wished on a user's machine using a variety of scripting languages, such as Java, ActiveX and even .NET objects. This feat was achieved by taking advantage of the way that Internet Explorer (and other browsers) handle active scripting in the Operating System." So you are building an online shop, and you'd like your visitors to find the ordering process as enjoyable as possible. Smashing Magazine is helping you getting inspired in their latest article showcasing 45 creative online-shops. "Being creative doesn't necessarily mean that the designs are successful as well since unconventional approaches often increase the time users need to climb the learning curve and figure out how they can achieve their goals. Still, how can you present your products in a distinctive way and how to design a truly unique online-store? Let’s find out." .